The capacity to be in time together lies at the heart of all music-making and is one of the most profound of human capabilities; being in time together is implicated in social bonding, altered states, and foundational pleasures associated with music. The ways in which we play in time together, also mark out difference-between genres and between instruments (and instrumentalists), between studio and live performance, between the virtuoso and the beginner. – How is the time of music implicated in social being and sociability? In what ways does the social penetrate the temporality of music? – Can we speak of cultures of time in music? How does the relatively tacit feel for time amongst musicians connect with the discursive? – What is the relationship between the relatively automatic capacity to be in time together and timekeeping as intentional and expressive? – In what ways have technologies changed our relationship to time in music? Is temporality changed through developments in recording and digital technologies? – What are the politics of musical time? – What methods are available to us to address questions of temporality, music, the social and the psychological? – How do we teach and learn about time in music? The conference committee is: Dr Mark Doffman, Dr Jonna Vuoskoski, and Dr Toby Young (all University of Oxford), and Dr Emily Payne (University of Leeds). DARE 2015, The Dark Precursor, is the first international conference entirely dedicated to the relation between artistic research and French philosopher Gilles Deleuze and/or Félix Guattari. The three-day will feature both artistic presentations and scholarly papers that investigate this relation. The Deleuze/Guattari’s philosophy acts as a key reference for many artist-researchers, who engage with knowledge across academic and non-academic fields of practice. The extent and depth of their influence on artistic research is largely uncharted, nor has their philosophy ever before been evaluated from the perspective of artists. 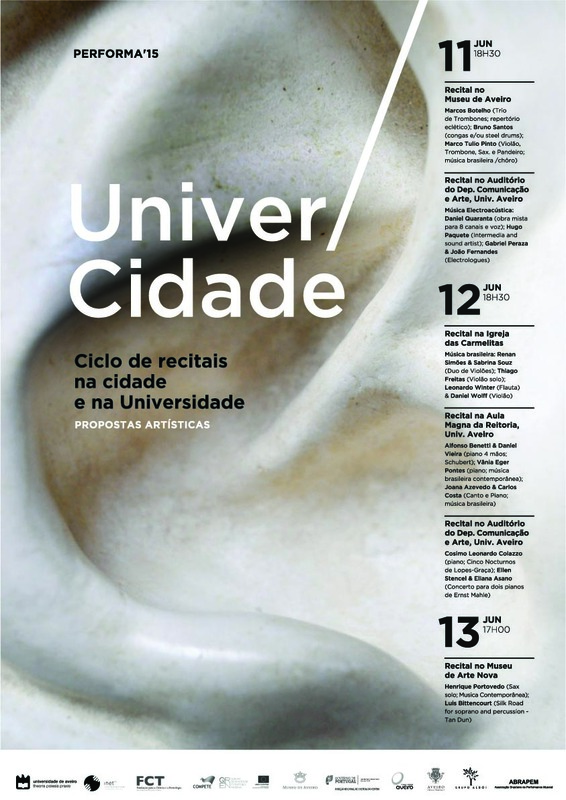 From June 11 till 13 Performa ’15 will take place at the University of Aveiro in Portugal. On June 11 I will open the conference with a keynote lecture entitled “Musical Performances are (not) Artistic Research”. Of course I will pay attention to my favorite topic, the relation between artistic research and knowledge; however, the major part of my presentation will consist of particular musical performances and their relation (or not) to artistic research. 30-31st October 2015: The University of Aberdeen and the SOUND festival, Aberdeen, Scotland. Theodor Adorno noted the difficulty of creating new art that can be beautiful in a truthful way, eschewing any response to musical modernity that would allow its easy assimilation in terms of the traditionally beautiful. For Jean-François Lyotard, the arts for the last century have no longer been concerned primarily with the beautiful but rather with a renewed concept of the sublime. This dissociation of the beautiful from the modern in Adorno and Lyotard contrasts strikingly with Helmut Lachenmann’s revalorisation of the beautiful and his distinction of ‘humanity’s legitimate and profoundly rooted demand for art as the experience of Beauty, and its false satisfaction and alienation in the form of art “fodder” manufactured by the bourgeoisie and preserved in a society of repressed contradictions’ (Lachenmann 1980, 20). Out of this polarity of the modern as the moment of the sublime (Lyotard) and the possibility of a ‘rescued’ concept of the beautiful (Lachenmann), participants are invited to offer twenty minute papers on any aspect of musical modernity in relation to the beautiful and/or the sublime. The sublime has become a rich source of reflection in critical theory, with alternative conceptualisations from Lyotard, Derrida, Lacan, Zizek, Marion and others, and following Simon Morley’s categorisation, the contemporary sublime has been related to the unpresentable, transcendence, nature, technology, terror, the uncanny and altered states. While the sublime has not enjoyed attention in music studies comparable with what it has stimulated elsewhere in the humanities, this conference will provide a forum for musicological, theoretical and philosophical reflection in conjunction with a series of musical performances. • Musicological papers considering any aspect of contemporary music in relation to the sublime and/or the beautiful. • Philosophical/Critical theory papers developing thinking on the beautiful and/or the sublime in relation to music. • Papers considering musical modernity, politics and the sublime. • Papers considering the extent to which music concerns the sublime or a reconstituted notion of beauty. Abstracts should be c. 400 words and should also contain first and last name of presenter, title of proposed presentation, institutional affiliation, mailing address, telephone number and email address. Proposals must be received no later than 20th April 2015 and should be posted toe.campbell@abdn.ac.uk. In collaboration with Studium Generale of Leiden University and several others, I am organizing 6 meetings between Dutch artists and scholars to talk about the role, function, and position of both the arts and the sciences in our contemporary society. The fourth Rhythm Changes conference: Jazz Utopia will take place at Birmingham City University in the United Kingdom from 14 to 17 April 2016. Claims have always been made for jazz as a certain utopian practice, in which jazz has made possible a musical-social space where different, usually marginal, identities are expressed and confirmed. At the multiracial club, bandstand, or dance-floor race and ethnicity are acknowledged, difference is championed or erased. Musicians have used jazz to step out of their class. The dialogic qualities and queer sounds alike of jazz offer opportunity for the expression of gender and sexuality. New thinking around disability and music reads jazz as a crip-space. Equally, consider the way in which freedom in improvisation has been understood as a liberating utopian practice. Even in its diasporic invention jazz comes from a kind of no-place (ou-topia = no place). In utopia, jazz is the effort to sound another world into being, the only condition of which is that it must be better. Has jazz really been that good? What does jazz mean to its community of insiders and those that approach it from outside? For those who are deeply involved with jazz, whether musicians, critics, scholars, or fans, the genre often provides a utopian space for creative encounters. By definition, the articulation of this space through performance, writing, research and consumption also creates a community of outsiders who may seek ways to engage with the jazz community or observe it from afar. This strand invites papers that address the relationships between jazz and its ‘others’, defined in relation to music making, criticism, scholarship or reception, whether these interactions are antagonistic or collaborative in tone. This strand focuses on the different ways in which heritage practices and archival work contribute to the reconfiguration of jazz as a utopian space. Through its commitment to alternative ways of living and being, jazz offers imaginative variations on themes of history and preservation. It creates communities of collectors and music lovers, who refigure jazz as nostalgia and escape, as well as renewal and return. We welcome papers that explore all aspects of archiving practice and cultural heritage and the opportunities and tensions that present themselves for scholars, institutions and practitioners in these fields. • Individual papers (20 minutes) – up to 350 words. • Themed paper sessions of three individual (20 minute) papers – 350 words per paper plus 350 words outlining the rationale for the session. • Seventy-five minute sessions in innovative formats – up to 1000 words outlining the form and content of the sessions. The deadline for proposals is 1st September 2015; outcomes will be communicated to authors by 1st October 2015. All paper submissions will be considered by the conference committee: Christa Bruckner-Haring, Nicholas Gebhardt, George McKay, Loes Rusch, Catherine Tackley, Walter van de Leur and Tony Whyton. The conference builds on the legacy of the Rhythm Changes research project. Rhythm Changes: Jazz Cultures and European Identities was funded as part of the Humanities in the European Research Area (HERA) Joint Research Programme, which ran from 2010-2013. The project team continues to develop networking opportunities and champion collaborative research into transnational jazz studies. For more than 20 years, the Utrecht Early Music Festival (FOMU) has worked together with STIMU in organizing workshops, conferences and masterclasses relating to historically inspired performance pratice. This year’s STIMU Symposium is entitled The past is a foreign country, it takes place from 28 to 30 August 2015, and it thematizes the cultural position and attitudes of the researcher in the study and performance practice of early music. Curators are Jed Wentz and Barbara Titus. – Individual papers: 20 minutes, with 10 minutes for questions at the end. – Lecture recitals: 30 minutes, with 10 minutes for questions at the end. Young scholars currently enrolled in a master programme (either at conservatory or university level), or who have recently graduated from one, may apply to speak in the Festival Symposium using the following form. Young scholars whose work is accepted will receive travel expenses and accommodation in Utrecht during the course of the Symposium. Applications should consist of a proposal of a maximum of 250 words and a short biographical sketch, and can be sent to j.wentz@oudemuziek.nl by 15 May 2015 at the latest.